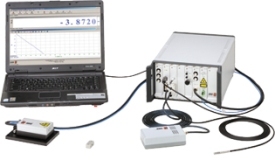 Length measurement systems from SIOS based on Laser interferometry, standard products but also custom made designs to solve your specific need. We have here our standard protfolio on display, if this will not feed your need completely let us know and we build your custom interferometer. The reflected laser beam is shifted sideways and returns parallel to the outgoing beam. Single laser beam with the same optical path for the reflected measuring beam. In case of using plane mirrors a lateral movement of the mirror or of the interferometer orthogonal to the measuring axis is possible. In case of using ball or hollow reflectors with high tilting invariance the adjustment of the interferometer is very easy. The measuring distance is increased compared to the mirror reflector. Laser interferometer with minimum 2 beams – The path length difference of the beams detects the length. Differential measurement minimizes environmental effects.